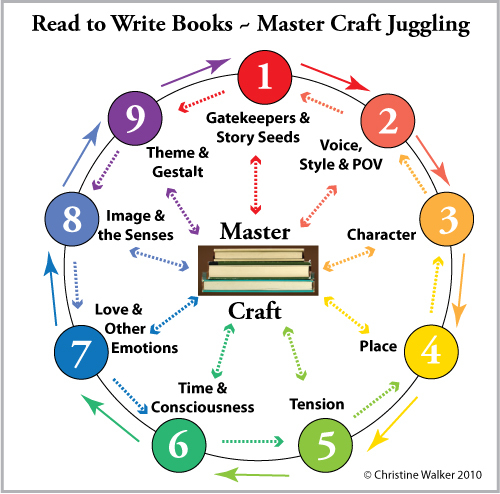 Writing a book is like juggling balloons. You pay attention to one element or the other, while a centrifugal force in your mind keeps them floating together in a big balloon cloud above your head. In Read to Write, we begin with first sentences (front gatekeepers), because that’s where we begin as readers. A writer may, in fact, begin in any number of places—with a story seed (whether consciously or not), a character, place, theme, or any other craft element. This diagram shows how the course structure works for your manuscript draft or revision or to gain understanding of an author’s mastery. As we start at 1, thinking about beginnings, we’re also looking to the end (last sentences, gates swinging shut or opening out past the story) and to all that comes between. When writing a book, each craft element influences the development of all the others, and as the book builds from its essential reason for being, the cumulative effect of the elements reaches out to re-influence each element again individually. This back-and-forth and circular dynamic enriches the writing and the book’s gestalt. Initial close examination of a few sentences sets the standard for mastery. The book is composed of sentences, paragraphs, scenes, and chapters, into which we infuse all the elements. The thrill and challenge of writing a book is in keeping it all juggling in the air, whether while writing or going about other activities and consciously or subconsciously tucking new thoughts and observations up into the individual thought balloons and the larger whole. Books by masterful authors, whether read during the course of working on a project or echoing from having been read however long ago, continually instruct and influence a writer’s processes and projects. The diagram above shows why a book project may feel like its spinning totally out of control at times or like its humming along at other times. The writer must make each element serve the cumulative effect of the book. Elements out of balance throw off synchronicity. Writers go through a semblance of this craft process many times, perhaps many hundreds of times, when writing a book. And with each new project, they begin again. Call it revision, but it’s more than that. It’s mastery, for which there are no direct routes, easy steps, or guaranteed results. No matter how skilled or famous the writer is, each new book calls for juggling its own way. This entry was posted in 0 Introduction to Craft, 1 Gatekeepers & Story Seeds, 2 Voice, Style & POV, 3 Character Development, 4 Place, 5 Tension on the Page, 6 Time & Consciousness, 7 Love & Other Emotions, 8 Image & Senses, 9 Theme & Gestalt, Books as Teachers, Master Craft Juggling by Christine Walker. Bookmark the permalink.